The Toronto Maple Leafs announced Tuesday that the team has signed University of Denver forward and Thousand Oaks native Trevor Moore to a three-year, entry-level contract. Moore, who signed as a free agent, will give up his final year of NCAA eligibility. In 40 games with the Pioneers last season, Moore compiled 44 points (11 goals, 33 assists) and just eight penalty minutes. Moore finished tied for sixth in the conference scoring race with 35 points (nine goals, 26 assists) in 31 games. 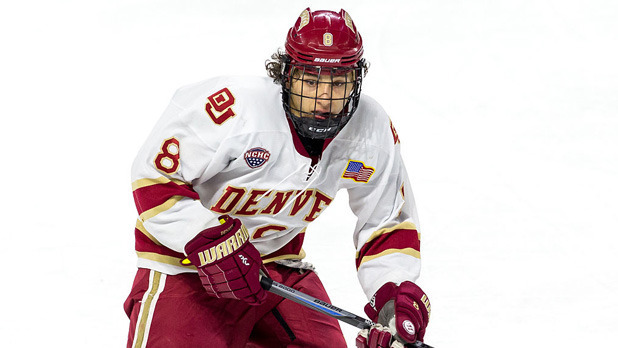 In 121 career games at Denver, Moore registered 120 points (47 goals, 73 assists) and was part of the DU team that reached the Frozen Four this past spring. During the 2014-15 season, he was named to the NCHC First All-Star Team and was the conference’s Forward of the Year. In 2013-14, Moore was named to the NCHC All-Rookie Team. As a youth, Moore played for the LA Hockey Club.